The Prime Minister of Malaysia (Malay: Perdana Menteri Malaysia) is the head of government and the highest political office in Malaysia. The Yang di-Pertuan Agong appoints Prime Minister as a Member of Parliament (MP) who, in his opinion, is most likely to command the confidence of a majority of MPs. The Prime Minister chairs the Cabinet of Malaysia, the de facto executive branch of government. On 18 October 2018, 7th Prime Minister, Mahathir Mohamad, announced a two-term limit (10 years Max) to all Cabinet Profolio. After the formation of Malaysia on 16 September 1963, Tunku Abdul Rahman, the Chief Minister of the Federation of Malaya, became Prime Minister of Malaysia. From independence until the 2018 general election, the Prime Minister had always been from the United Malays National Organisation (UMNO) party of Barisan Nasional (previously Alliance). 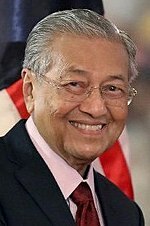 Following a general election, Mahathir Mohamad took office on 10 May 2018, as the first Prime Minister of the opposition coalition, Pakatan Harapan (PH). Mahathir is the first Prime Minister not to represent the Alliance/Barisan Nasional coalition. He is also the first Malaysian Prime Minister to serve from two different parties and on non-consecutive terms. Mahathir and the PH coalition have confirmed that, after a period of around 2 years, People's Justice Party (PKR) leader Anwar Ibrahim will take over as Prime Minister. On 11 June 2018, Mahathir said he's prepared to stay as Prime Minister for more than two years if that is what members of the public wants. According to the federal constitution, the Yang di-Pertuan Agong shall first appoint as Prime Minister to preside over the Cabinet and requires such Prime Minister to be a member of the Dewan Rakyat (House of Representatives) who in his judgment is likely to command the confidence of the majority of the members of that House and must not a Malaysian citizen by naturalisation or by registration. The Yang di-Pertuan Agong on the Prime Minister's advice shall appoint other Ministers from either Dewan Rakyat or Dewan Negara (Senate). The Prime Minister and his cabinet ministers must take and subscribe in the presence of the Yang di-Pertuan Agong the oath of office and allegiance as well as the oath of secrecy before they can exercise the functions of office. The Cabinet shall be collectively responsible to Parliament of Malaysia. The members of the Cabinet shall not hold any office of profit and engage in any trade, business or profession that will cause conflict of interest. The Prime Minister's Department (sometimes referred to as the Prime Minister's Office) is the body and ministry in which the Prime Minister exercises its functions and powers. If a government cannot get its appropriation (budget) legislation passed by the House of Representatives, or the house passes a vote of "no confidence" in the government, the Prime Minister is bound by convention to resign immediately. The Yang di-Pertuan Agong's choice of replacement prime minister will be dictated by the circumstances. Ministers other than the Prime Minister shall hold office during the pleasure of the Yang di-Pertuan Agong, unless the appointment of any Minister shall have been revoked by the Yang di-Pertuan Agong on the advice of the Prime Minister but any Minister may resign his office. Following a resignation in other circumstances, defeated in an election or the death of a prime minister, the Yang di-Pertuan Agong will generally appoint as Prime Minister the person voted by the governing party as their new leader. The power of the prime minister is subject to a number of limitations. Prime ministers removed as leader of his or her party, or whose government loses a vote of no confidence in the House of Representatives, must advise a new election of the lower house or resign the office. The defeat of a supply bill (one that concerns the spending of money) or unable to pass important policy-related legislation is seen to require the resignation of the government or dissolution of Parliament, much like a non-confidence vote, since a government that cannot spend money is hamstrung, also called loss of supply. The prime minister's party will normally have a majority in the House of Representatives and party discipline is exceptionally strong in Malaysian politics, so passage of the government's legislation through the House of Representatives is mostly a formality. the appointment of the Governors of Malacca, Penang, Sabah and Sarawak. Under Article 39 of the Constitution, executive authority is vested in the Yang di-Pertuan Agong. However, Article 40(1) states that in most cases, the Yang di-Pertuan Agong is bound to exercise his powers on the advice of the Cabinet or a minister acting under the Cabinet's general authority. Thus, most of the day-to-day work of governing is actually done by the Prime Minister and the Cabinet. Under Article 55(3) of Constitution of Malaysia, the lower house of Parliament unless sooner dissolved by the Yang di-Pertuan Agong with his own discretion on the advice of the prime minister shall continue for five years from the date of its first meeting. Article 55(4) of the Constitution permits a delay of 60 days of general election to be held from the date of dissolution and Parliament shall be summoned to meet on a date not later than 120 days from the date of dissolution. Conventionally, between the dissolution of one Parliament and the convening of the next, the prime minister and the cabinet remain in office in a caretaker capacity. From time to time prime ministers are required to leave the country on business and a deputy is appointed to take their place during that time. In the days before jet aeroplanes, such absences could be for extended periods. Abdul Razak Hussein was the Acting Prime Minister after the first Prime Minister, Tunku Abdul Rahman stepped down as Prime Minister for three months in 1959 to strengthen his party, the Alliance for the 1959 federal elections after it had lost two states, Kelantan and Terengganu, in the State Elections which at that time were held before the Federal contest. Ismail Abdul Rahman occasionally acted as Acting Prime Minister when Tunku Abdul Rahman and Abdul Razak Hussein was on leave for going abroad. V. T. Sambanthan was called to serve as Acting Prime Minister and chair the cabinet meeting for a day when the former Prime Minister Abdul Razak Hussein was overseas and his deputy Ismail Abdul Rahman had died. In 1988, when UMNO as the founding member of the Barisan Nasional coalition was declared unlawful and illegal political party, Mahathir Mohamad was disqualified as the Barisan Nasional chairman. Ling Liong Sik became the new Chairman of the Barisan Nasional and served as an Acting Prime Minister for a couple of days until the new party, UMNO Baru was legalised by the Registrar of Societies (ROS). Anwar Ibrahim acted as an Acting Prime Minister for two months started from 19 May 1997 as Mahathir Mohamad was on vacation. First Malayan Five-Year Plan; Malayan Emergency; Second Malayan Five-Year Plan; National Education Policy; Indonesia–Malaysia confrontation; Malaysia Agreement; PAP–UMNO relations; Independence of Singapore Agreement 1965; 1966 Sarawak Emergency; First Malaysia Plan; Association of Southeast Asian Nations; Organisation of Islamic Cooperation; 13 May Incident; Served as Minister of Home Affairs, Minister of Foreign Affairs, Minister of External Affairs, Minister of Information and Broadcasting, Minister of Youth, Culture and Sports. He is often referred to as Father of Independence (Bapa Kemerdekaan) and Father of Malaysia (Bapa Malaysia). Razak Report; National Operations Council; 1971 constitutional amendments; Zone of Peace, Freedom and Neutrality; National Culture Policy; National Energy Policy; National Petroleum Policy; Second Malaysia Plan; Malaysian New Economic Policy; The youngest to be elected in the office, at the age of 48. Served as Minister of Education, Minister of Defence, Minister of Rural Development, Minister of National and Rural Development, Minister of Lands and Mines, Minister of Home Affairs, Minister of Foreign Affairs, Minister of Finance. He is referred to as Father of Development (Bapa Pembangunan). Third Malaysia Plan; 1977 Kelantan Emergency; Malaysian Technical Corporation Plan; Fourth Malaysia Plan. Served as Minister of Education, Minister of Commerce and Industry, Minister of Finance, Minister of Coordination of Public Corporations, Minister of Defence, Minister of Federal Territories. He is referred to as Father of Unity (Bapa Perpaduan). Clean, Fair and Trustworthy; Look East Policy; Privatisation Policy; Malaysia Incorporated Policy; Buy British Last; Leadership by Example; 70 Million Population Policy; Heavy Industry Policy; Application of Islamic Values Policy; 1983 constitutional amendments; Fifth Malaysia Plan; 1986 Sabah Emergency; Operation Lalang; 1988 constitutional amendments; Vision 2020; Sixth Malaysia Plan; 1993 constitutional amendments; Seventh Malaysia Plan; Eighth Malaysia Plan; He is the longest-serving Prime Minister of Malaysia. He led the BN into 5 consecutive election victories. Served as Minister of Education, Minister of Commerce and Industry, Minister of Defence, Minister of Home Affairs, Minister of Finance. He is referred to as Father of Modernisation (Bapa Pemodenan). Ninth Malaysia Plan. Served as Minister without Portfolio, Minister in the Prime Minister's Department, Minister of Education, Minister of Defence, Minister of Foreign Affairs, Minister of Home Affairs, Minister of Finance, Minister of Internal Security. He is referred to as Father of Human Capital Development (Bapa Pembangunan Modal Insan). 1MDB; Tenth Malaysia Plan; Eleventh Malaysia Plan; Prior to his appointment as PM, he served as Minister of Culture, Youth and Sports, Minister of Youth and Sports, Minister of Defence, Minister of Education, Minister of Finance. This is his second appointment as Prime Minister, 15 years after his retirement from politics. He was the fourth Prime Minister of Malaysia from 1981 to 2003 and referred as Father of Modernisation (Bapa Pemodenan). He is the only person to hold the position for two opposing political parties. He is the oldest Prime Minister to be elected at the age of 92. Prime ministers are usually granted certain privileges after leaving office at government expense. Former prime ministers continue to be important national figures. The most recently deceased prime minister was Tunku Abdul Rahman (1903–1990), who died on 6 December 1990. Currently the oldest living former prime minister is Abdullah Ahmad Badawi at the age of 79. Wikimedia Commons has media related to Prime ministers of Malaysia. ^ "CPPS Policy Factsheet: Remuneration of Elected Officials in Malaysia" (PDF). Centre for Public Policy Studies. Archived from the original (PDF) on 11 May 2016. Retrieved 11 May 2016. ^ Melissa Goh (11 June 2018). "Malaysia's PM Mahathir may stay on beyond 2 years, harbours ambition for new national car project". Channel NewsAsia. Retrieved 12 July 2018. ^ "Tokoh Negara" (in Malay). Malaysia Merdeka. Archived from the original on 27 April 2011. Retrieved 27 September 2013. ^ Vigneswaran Kannan (11 March 2012). "We should not forget Sambanthan's contributions". The Star. Archived from the original on 23 August 2015. Retrieved 7 September 2012. ^ "Anwar akan menjalankan tugas Presiden UMNO" (PDF). Perdana Library. 10 May 1997. ^ "Anwar memangku Presiden UMNO" (PDF). Perdana Library. 11 May 1997.